It feels a little bit weird to be writing this post only moments after writing another post about an exceptionally good meal that I recently ate. This past Friday, I brought my car in for some service and noticed a guy getting off the bus. At first glance he looked like any other hipster type guy in SC. Tight black pants. Black shoes. Many a little bit straggly… I ignored him and ducked into the Van Cafe. After chatting with the guys for a moment to detail out what I needed to have looked at, I hopped on my bike and started riding home. A little ways ahead of me was the same guy. From behind, I got a better look. Those tight pants, well those were actually a loose fitting pair of long johns that were inside out. The black jacket was a down one. Straggly? Yeah, this guy was homeless. As I got closer, he slipped around the side of a wrought iron fence and, holding onto the fence, he leaned way down over the edge to pick something up. It was a plate of discarded food. Dried and rotting. He immediately used his dirty fingers to scrape up what was on the plate and shove it into his mouth. When I left the house that morning, I knew I was just going to be dropping my car off and riding home on the bike. When I’m biking, I sometimes don’t like to have a lot of crap in my pockets. Keys are necessary but, on this trip, I left my phone and wallet at home. I double checked. Yeah, no wallet. I really wanted to give this guy some money for something to eat. Why do we often think the worst when we hear the word “homeless”? 10 dollar bill in hand, I raced back down the street to see if I could catch up with the man in black. Looking around the corner, i saw him in the Safeway parking lot, pulling a discarded coffee cup out of the garbage and taking a swig of what remained..
“Hey man, I noticed that you looked pretty hungry and I wanted to give you money to grab something to eat”. He looked up at me – surprised that someone was talking to him. I held out the folded 10 dollar bill. I started to ride away but then something started gnawing at me. How do I know he’s going to use this for food? What if I’m feeding his addiction instead? I followed him into the grocery and asked for reassurance. “Yeah, I’m going to use this to get some cereal and some milk”. I’ll get a cup from the coffee shop and a spoon. Okay. I headed out again and then circled back to make sure that he got in line. He did. In the past, I’ve always felt compelled to buy stuff food for homeless people. It would seem like giving cash wouldn’t necessarily always be helpful especially if they had an addiction issue. But I’m challenged by this idea of trying to help but then telling people how I want them to use the help. Maybe the fix that he could get with that 10 dollars would be the rock bottom that he would need to find to make a significant change in his life..
I’m wondering now whether I was being heavy handed in following him into the store and insisting that this grown man buy food. Is this indignity even worse than that of reaching into the garbage to find food under some sort of cloak of assumed anonymity? We are living in a time of great abundance but many people haven’t been afforded the opportunities that we have. 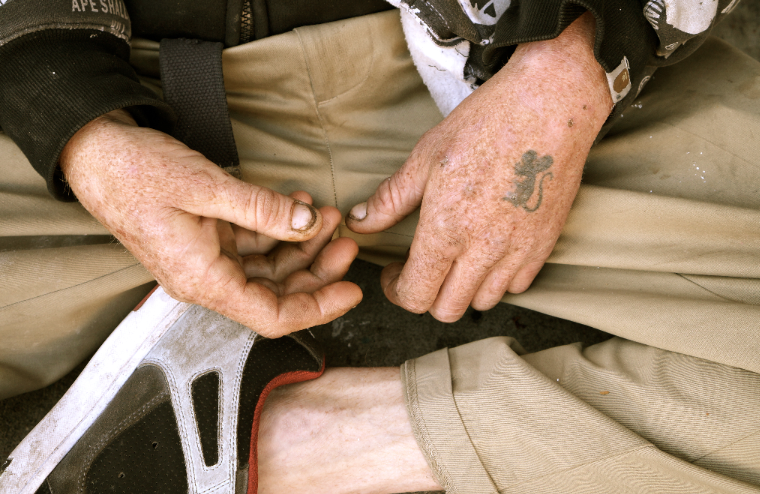 How can we help the homeless, the hungry… those with addiction issues and still treat them with dignity and respect?